When you are done with mastering casting on stitches and learning the basic knit stitch, it is time to learn a very simple but beautiful rib pattern – Fisherman’s Rib Knit Stitch. In this tutorial, we explain how to knit an infinity scarf for beginners step-by-step an easy pattern that uses only knit and slip stitches. It is a very fast and stretchy rib so it can be used for a variety of easy knitting projects such as scarves including infinity scarves, hats, and headbands (ear-warmers). The best practice is repetition, so we suggest creating something warm and useful that you can wear during cold winter months or give as a gift to your family, while you practice this easy pattern for your future knitted infinity scarf. It is an heirloom pattern to add to your library of knitting stitches. This timeless pattern is also known as brioche rib, textured rib, English rib, or fisherman’s rib (though some tutorials would teach fisherman rib differently – but you end up with the same result!). It makes it an ideal pattern for infinity scarves or other similar projects as it is stretchy and looks the same on both sides, so it is reversible. the yarn is controlled by your left hand, the working needle is in your right hand. 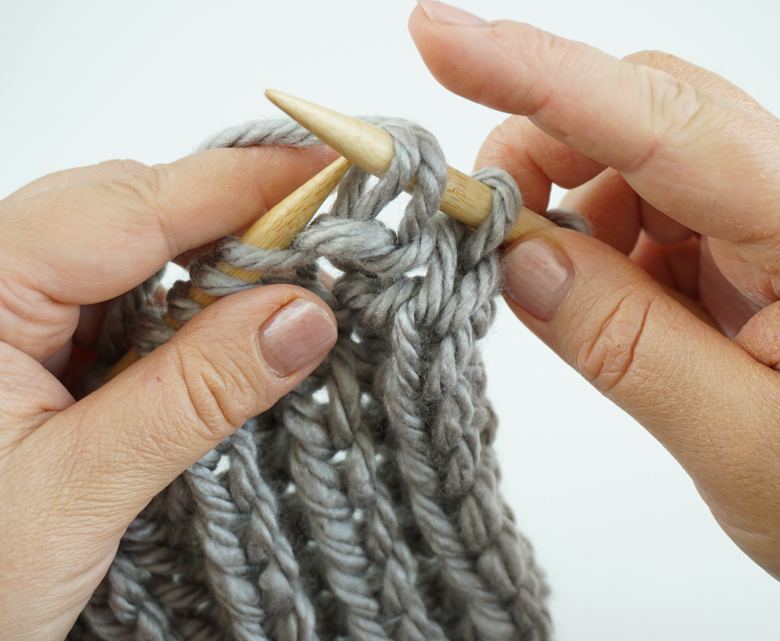 There is no wrapping of yarn around the needle with your right hand (as in English/American style) so it makes it very speedy, super-simple, and easy to learn for beginner knitters. As an added benefit, it is much easier on your wrists in the long run and won’t strain your joints. When you learn basic stitch techniques, they will stay in your memory, so it is easy to pick up where you left off several days, years (or decades) later. Start with casting on an even number of stitches very loosely (14-16 for a bulky infinity scarf, depending on your yarn type and size of needles). After you knit 10-20 rows of your pattern, you can always decide if this is the right width and reduce or increase the number of stitches to cast on. The wider is your scarf, the more yarn your project will need for the same length. For detailed instructions on how to cast on stitches, please refer to our tutorial and video addressing cast-on techniques. The first stitch is an edge stitch which you simply slip – it makes a beautiful and neat chain stitch on the edge of your project. 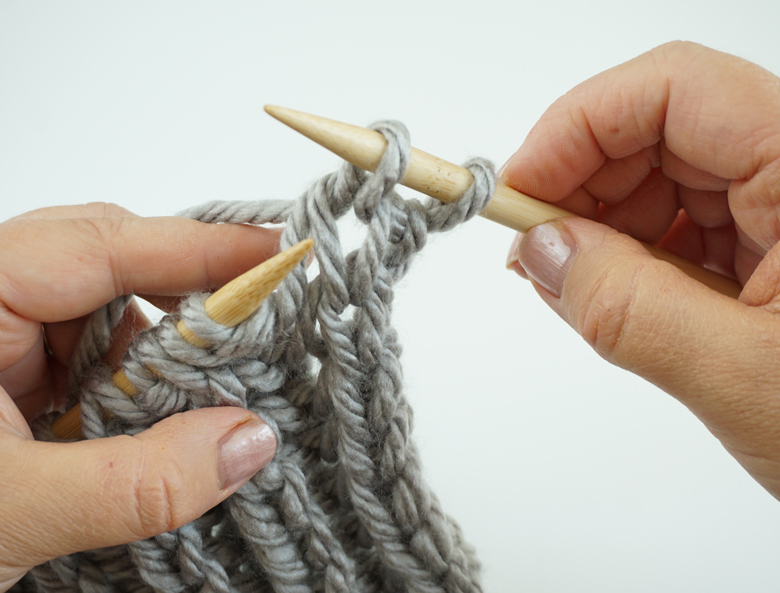 We know, many other tutorials teach you to KNIT the first stitch – we disagree with this practice. So, learn the way your grandma always did it for hundreds of years before us – slip the 1st edge stitch! K1: Insert point of the right needle in the loop of the second stitch, draw yarn through the loop with right needlepoint and then simply push the left needle with your right index finger to slip the underlying stitch off the left needle. YOSl: Then put the yarn over your needle and simply slip the next stitch (with yarn over it) off purlwise without knitting it through. It is the easiest stitch in knitting! Turn your work over. Repeat 2nd row for the rest of the project until your scarf reaches the desired length. Congratulations! That’s all it is – Fisherman’s rib is a very easy & fast knitting pattern. Here it is in a nutshell, so you would never get lost knitting fisherman rib pattern. If you see a purl stitch, put the yarn over and slip it off. If you see a knit stitch with a yarn over, simply knit it together. If you know how to do a knit stitch, you can create this beautiful 3-D textured rib that looks great. Now you’ve learned the versatile rib pattern that you can use for a variety of easy and satisfying knitting projects. The versatility of this stitch is in the fact that it looks the same on both sides, making it the perfect stitch for two-sided simple knitting projects such as scarves, baby blankets, throws, etc. We’ve included an infinity scarf knitting pattern below so you can master the knit stitch & slip stitch technique. Just a note: this rib pattern requires more yarn than your usual ribs, so overestimate the amount of yarn you would need so you don’t run out before you have a scar of the desired length. You can always use leftovers for a small dishcloth, doll scarf or knit a present for a furry friend. Now you are ready to conquer other rib knitting patterns. For knitting help and tutorials refer to our website and upcoming Youtube channel. Cast on 16 stitches (even number of stitches). Repeat row 2 until your scarf reaches the desired length. Bind off. Weave in ends. Connect the ends of the scarf to make a loop. We hope you enjoyed this Rib knit stitch tutorial and your new infinity scarf.